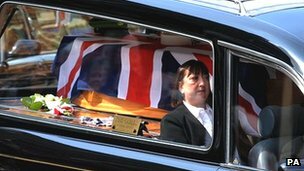 07-May-2012 --- A West Yorkshire soldier killed in a bomb attack in Afghanistan has been described as "courageous" by one of his commanding officers at his funeral. Pte Anthony Frampton, 20, of 3rd Battalion, the Yorkshire Regiment, was caught in an explosion on 6 March. Pte Frampton died alongside five colleagues while on patrol in an armoured vehicle in Kandahar province. Hundreds of people lined the streets around Huddersfield Parish Church as Pte Frampton's funeral got under way. His coffin was carried into the church with full military honours as onlookers burst into spontaneous applause.